A simple letter can have a life-changing impact. We serve a fatherless generation of prison orphans—some who have literally no contact with the outside world. The good news is that HOPE is only a letter away. Help us connect our students in African prisons with encouragement from around the world. A simple letter can have a life-changing impact. Some prisoners are so desperate for contact with the outside world that they fill out subscription cards taken from old magazines, just so they will receive a response from the publisher with a pro forma invoice – a letter. In the midst of all the violence and other stereotypes, prison is a boring place. 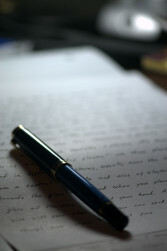 A letter is a welcome interruption from the mind-numbing routine of incarceration. It is a reminder that the world is bigger than the moldy concrete walls of your cell. It is a reminder that you are still human. You have the opportunity to make the difference in someone’s life by being a trusted friend with an open ear. You do not need previous experience in prison ministry or a background in counseling. You can participate from anywhere in the world, because all the letters will be routed through our secure network. Our team of volunteers has over two decades of experience, and they will be there with training and support. Most importantly, we draw courage from the promise of Psalm 119:105, “Your word is a lamp unto my feet and a light unto my path.” You are simply reflecting this light into a dark world. Yes! I would like to be an encouragement for someone behind bars.